Joshua Mensah landed at Eastern Mennonite University because his Nobel prize-winning mother, Leymah Gbowee, wanted him to go to a Christian college that emphasizes community and peacebuilding. A digital media major, Mensah received his bachelor’s degree from EMU on April 27. His mother, a 2007 MA graduate of EMU who received the Nobel Peace Prize in 2011, was the commencement speaker. Mensah hopes to return to Africa to share what he’s learned with his generation of budding artists after completing his cross-cultural requirement at EMU’s Washington Community Scholars Center this summer. This spring, for example, Mensah was part of a group of student videographers who produced “To Wisconsin With Love: Offerings on Water, Land and Culture,” a documentary that linked a chemical spill in West Virginia’s Elk River in early 2014 to pollution feared from a proposed 4.5-mile open-pit iron mine in Wisconsin’s Penokee Hills. Mensah’s artistic skills were apparent at a young age. In high school he began hand-painting designs onto white t-shirts. He now has a line of international urban clothing which he sells through www.thedublifeco.com/. During his junior year in the only business class he took at EMU, Mensah parlayed his idea for an app to a second-place finish in a business plan weekend at James Madison University. He convincingly communicated the concept for his event finder and planner app, which he named “Vite-us,” to the win the “silver medal” among 24 competitors. He also won a business plan competition among students taught by EMU business professor Tony Smith. Mensah’s multiple talents were on display in the music video he created for his senior show in early April, an original song “Beauty” to celebrate the life of a high school friend who died earlier this year in Ghana. Combining original lyrics, collaborative music by a high school friend and a kaleidoscopic montage of double-exposure video, Mensah’s capstone project showcased his visual and musical abilities. “What pushed me to make this project – I’d hear people say, ‘Oh, your friend was so beautiful.’ I felt like they didn’t know how beautiful she really was. They only saw the physical beauty,” says Mensah. “You can’t rely on how you look to sustain you. What is fundamentally beautiful is compassion for yourself and your people,” is the Lupita Nyong’o quote he chose for the opening lines. 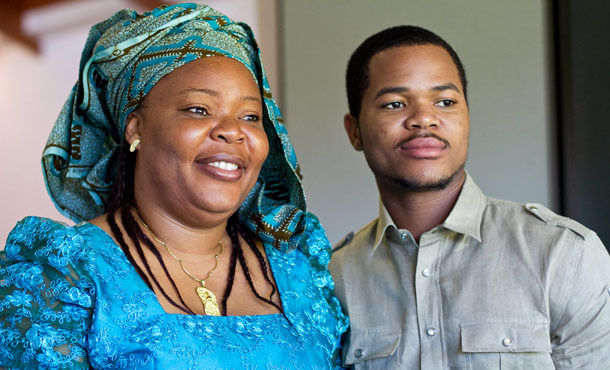 Gbowee’s advice to her son during his college years? “Work hard…and focus. Focus, that’s the one word I try to remember,” says Mensah. Great Inspiring Article. Thanks for sharing. Specially the sentences in the ending paragraph really motivates me. Thank you so much Joshua for making us proud, keep your head up and put God first and you will never be last !